Water is the source of energy. Directing the flow to touch the lives of the deprived is a commitment for Sri Sathya Sai Central Trust. The Trust believes that every individual is infinite in his power to unfold. All that a person needs to express his uniqueness is an opportunity to move away from the shadows of poverty, ignorance and disease. Sri Sathya Sai Central Trust creates that opportunity - with education to enlighten minds. Advanced medical facilities to renew and revive the human spirit. And now, the water supply project to meet a basic need. Sri Sathya Sai Central Trust reaches out to the poor in various ways, so that they may immerse themselves fully into the stream of life. Typical cistern (2500 litre capacity) installed at various villages. Large diameter pippes being unloaded at a railway yard. 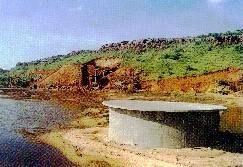 100.000 litre overhead reservoir at Puttaparthy village. He reached out, and clear springs flowed through the wilderness and parched lands. Gentle laughter rippling through more than 700 villages. 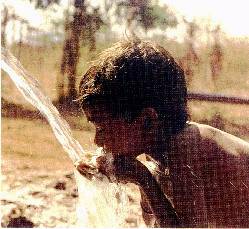 This dream turn into reality as safe, fluoride-free water flows into the parched Ananthapur district of Andhra Pradesh. Sri Sathya Sai Water Supply Project made it possible - in less than a year. Bhagwan Sri Sathya Sai Baba reached out to the forgotten villages with a deep sense of urgency. And the project moved towards comletion with speed and efficiency. Behind it all is the power of commitment and service - a power tha tattracts many talents. Creates a synergy of effort directed towards changing the quality of life in the wilderness of Rayalaseema. 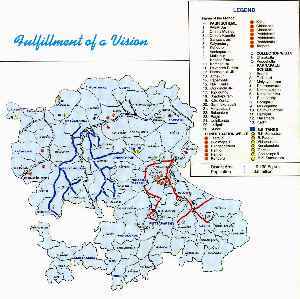 In November 1994, Bhagwan Sri Sathya Sai Baba widened the scope of the Government's awareness to include Rayalaseema. The Panchayat Raj Department of Andhra Pradesh Government moved quickly. 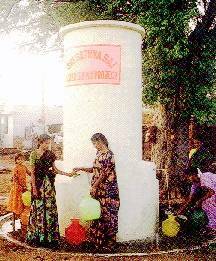 Submitted plans for providing drinking water to more than 700 villages and urban centres such as Ananthapur, Dharmavaram, Kadiri... as indicated by Sri Sathya Sai Centra Trust. Initial cost was estimated at Rs. 70 crores (18 Mio. US-$). But a detailed working resulted in an outlay of about Rs. 175 crores (45 Mio. US-$). For Bhagwan Sri Sathya Sai Baba, the benefit to the people was far more important than the cost. He valued people. Entrusted the challenging task to ECC-Construction Group of Larsen & Toubro Ltd. And the project took off. Water being tapped through three infiltration wells of 5m diameter at Chitravathi Balancing Reservoir for Puttaparthy water pipeline. 150.000 litre overhead reservoir at Pennukonda village. Collection well at river Chitravathi for the Puttaparthy sector. Comprehensie Protected Water Supply Schemes involve infiltration wells, collection wells and associated pumping behind the Chitravati Balancing Reservoir at Peddekotla and Chinakotla villages. Sources for infiltration wells include Pennar and Hagari Rivers. Direct pumping from Pennahobilam Balancing Reservoir and treatment through rapid sand filtration system. 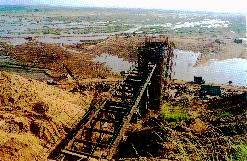 Comprehensive Water Supply Schemes (CPWS) through seven summer storage tanks ranging up to 100 acres by tapping water from the Tungabhadra High Level Canal, when water flows in the canal. 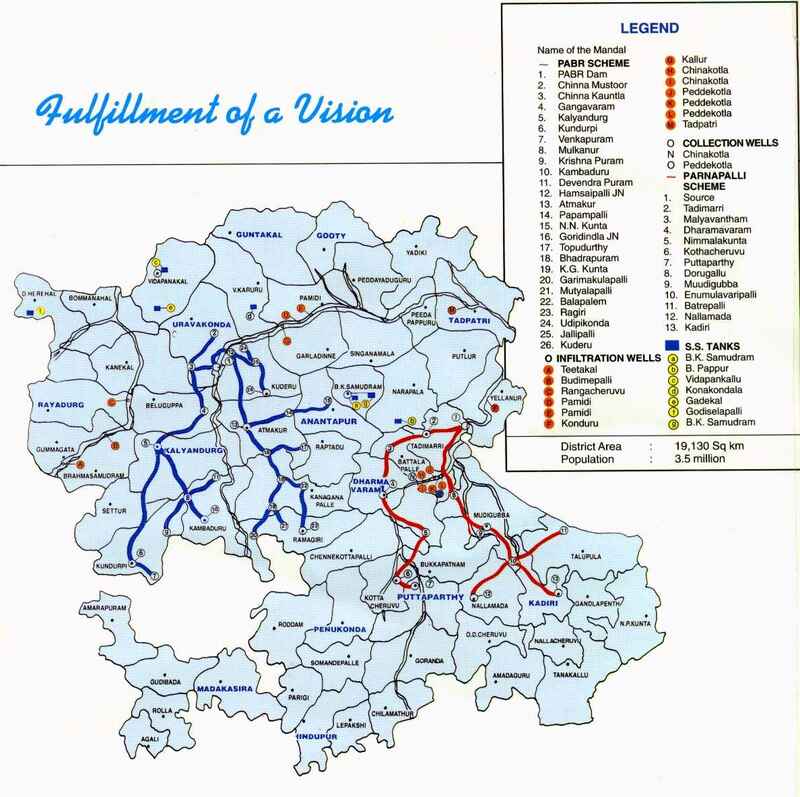 The Pretected Water Supply Scheme (PWS) covers 290 villages. It involves drilling deep borewells, construction of storage tanks and installation of pipeline networks. Sri Sathya Sai Water Supply Project is a collaborative effort of Sri Sathya Sai Central Trust, the Government of Andhra Pradesh and Larsen & Toubro Ltd. It was Bhagwan Sri Sathya Sai Baba who brought these three distinctly different organisations together. He inspired them to wirk with a unity of purpose, and harmony of thought. The spirit of involvement extended to thousands of villagers who pooled in their efforts to make the impossible come true. Never has a project of this magnitude been executed within a short span of less than a year. Bhagwan Sri Sathya Sai Baba has once again led the way in showing that the success of all endeavour depends on unity, purity and divinity. 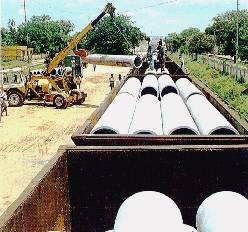 Laying of more than 2000 km of AC, CI, DI, MS and PVC pipelines. Diameters range from 80 mm to 600 mm. Construction of 25 sumps from 100.000 to 2.500.000 litre capacity. Construction of 20 balancing reservoirs at the top of hillocks with capacities ranging from 300.000 to 1.000.000 litres. 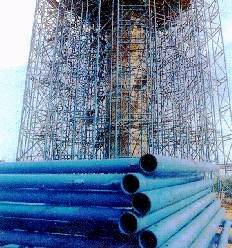 Construction of 275 overhead reservoirs. Capacities range from 40.000 litres to 300.000 litres. 125 ground level reservoirs. Capacities range from 20.000 litres to 80.000 litres. Installation of more than 1000 precast concrete cisterns of 2.500 litres capacity, with provision for 4 taps to be used by the villagers. As this unique and challenging project took shape, L&T's construction machinery resounded through steep terrain, barren land, unapproachable territory. And L&T's high powered team worked round the clock to make a dream come true in Rayalaseema. And it all happend because Bhagwan Sri Sathya Sai Baba stopped to think, to feel. To create a new world for people long forgotten in the wilderness. (News Paper from Andhra Pradesh, India) Anantapur: Amidst drought, the people in 700 villages in Anantapur district are able to get drinking water, though not as per their requirements, thanks to the mega water supply project implemented by Sri Satya Sai Central Trust floated by Sri Satya Sai Baba of Puttaparthy. The Rs 300-crore protected drinking water supply scheme was put in place in a record time to benefit nine lakh people living in 700 villages. "After conferring the gift of free education and free advanced medical care on the poor, Sai Baba has done his bit for the water-starved people of the district," admits a Communist leader.